The Digital Arts Experience will now be offering classes on Sundays starting in January 2016. At The Digital Arts Experience, our goal is to offer cutting edge STEM/STEAM/computer technology classes for the kids and teens of Westchester County, New York. After running another series of successful Saturday programs this Fall, we have decided to now open our doors on Sundays! We find that weekends are for the most part more convenient for many families to enroll in our programs and visit our facility. With Saturday as one of our busiest days, it was a no-brainer to us to open our doors on Sundays. With Blender, a 3D modeling and texturing program, students will learn to create detailed 3D models and sculptures. Using a digital drawing tablet, students will learn how to sculpt an object from scratch into a highly detailed character. Each week students will work on different projects to hone their skills and by the end of the class will have portfolio ready projects completed. Wearable technology is becoming more and more popular everyday, especially when devices such as fit bits and apple watches exist. However, what if we were to incorporate technology into fashion? In this class, students will learn to invent and create a functional wearable garment, such as a shirt that lights up when reacting to sound, light, or temperature. From rings to earrings and necklaces and hair clips, there is practically no limitation to what you can create in this class. Using CAD software, students will design original pieces of custom fit jewelry. Students will also learn how to safely and proposal operate our 3D printers, and use them to print their creations! To view our Saturday 2016 schedule, please click here. To view Sunday 2016, please click here. 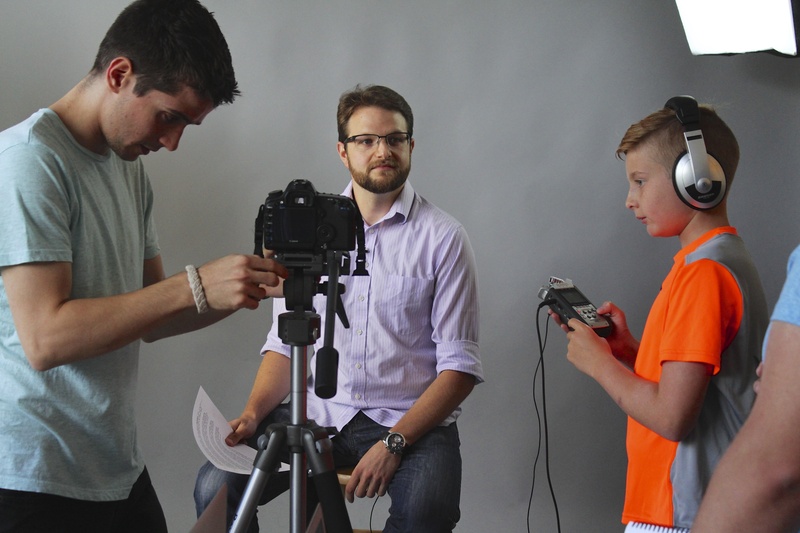 Our classes are small, 100% hands on and are project based so your child will develop social, technical and creative skills for the present and for the future. The classes are held at a max of 6-8 students so that everyone gets the personal, individualized attention they deserve. Everyone also gets their own computer to work on throughout the class, to enable them to work with the most up to date digital arts tools and technologies. Learn more about our classes through the class page of our website. Before we relive the highlights of the first part of the summer, there’s still plenty of time to end your summer at the Digital Arts Experience. Summer Session 4 runs from August 17th to the 28th, and we end our summer camps with Summer Session 5 from August 31st to September 4th. If you can’t make it for the summer, don’t worry because Fall Registration is currently live and the The DAExpress is taking bookings for Minecraft birthday parties. Our summer kicked off with a record high number of registrations for Summer Session 1 compared to previous years. We greatly enjoyed the packed facility and buzzing energy that brought along. On the last day of the first session, the DAE hosted a celebration for our 3 year anniversary! In addition to enjoying good food and company, attendants heard the DAE announce two new ventures: DAELearning and DAE Makerclub. DAElearning will be an online subscription based site that provides members with interesting, educational videos on Programming Languages, 3D Printing, Mac Basics, and much more.Members of DAE Makerclub will have complete and unlimited access to our facility including labs, 3D printers, and more. Then Summer Session 2 came along and broke the record the previous session had just set. This high number was partially due the numerous kids who reenrolled in our classes. Our site was at max capacity with every single computer being used! Summer Session 3 started smoothly and is currently going on. Check out a student made short film below. Learn about The Digital Arts Experience’s summer STEM and tech camp courses in ‪‎Westchester‬ County from President Rob Kissner. Visit http://www.TheDAE.com to learn more! The Digital Arts Experience summer STEM courses in Westchester County from President Rob Kissner. The Digital Arts Experience aims to provide a unique opportunity for the kids & teens of the Westchester, Rockland and Fairfield communities to explore the world of creative technology, digital art, STEM related fields and more! Our programs are goal oriented and focus on hands on learning so each and every student will complete his or her class with incredible original work that can go towards creating a portfolio. We strive to expose our students to the digital world in order to help them discover new talents and possible career paths. Starting next week, The Digital Arts Experience in White Plains, Westchester County NY will be running Spring Break STEM programs for kids and teens in 3D Printing, Animation, Coding, Design, Electronics and more! Click here to see the full schedule and register! USE PROMO CODE: SPBREAK TO RECEIVE $25 OFF ENROLLMENT! CAN’T MAKE NEXT WEEK? JOIN US FOR THE FOLLOWING WEEK! JOIN US FOR OUR NEXT GAMING TOURNAMENT DAY! LEAGUE OF LEGENDS & MINECRAFT PVP: APRIL 25TH. JOIN US FOR OUR NEXT GAMING TOURNAMENT DAY! LEAGUE OF LEGENDS & MINECRAFT PVP: APRIL 25TH. CLICK HERE TO LEARN MORE & REGISTER! Session 1 will run for 2-weeks from July 6th – July 17th. Morning session from 9:30AM – 12:00PM. Afternoon runs from 1:00PM – 3:30PM. Students can attend for the full day where they choose a morning activity and a separate afternoon activity, or just come in for a half day! CLICK HERE TO FIND OUR SUMMER STEM CAMP SCHEDULES! SIGN UP EARLY & SAVE! USE PROMO CODE: STEM2015 AT CHECKOUT AND RECEIVE 15% OFF A PROGRAM! When The Digital Arts Experience (The DAE) of White Plains opened its doors in July 2012, our main purpose was to provide After School & Summer Tech Camps to kids and teens throughout Westchester County. As The DAE began to expand upon the courses taught inside our facility, so did the demand for us to bring our programs offsite as well. With this came the idea for our Mobile Classroom, The DAExpress (The Digital Arts Express). The DAExpress was created to provide the most cutting edge technology in a state of the art learning environment available to the Westchester community. Inside The Digital Arts Express, or The DAExpress. Able to accommodate up to 10 students at once, The DAExpress is designed to act as one of our classrooms on wheels. 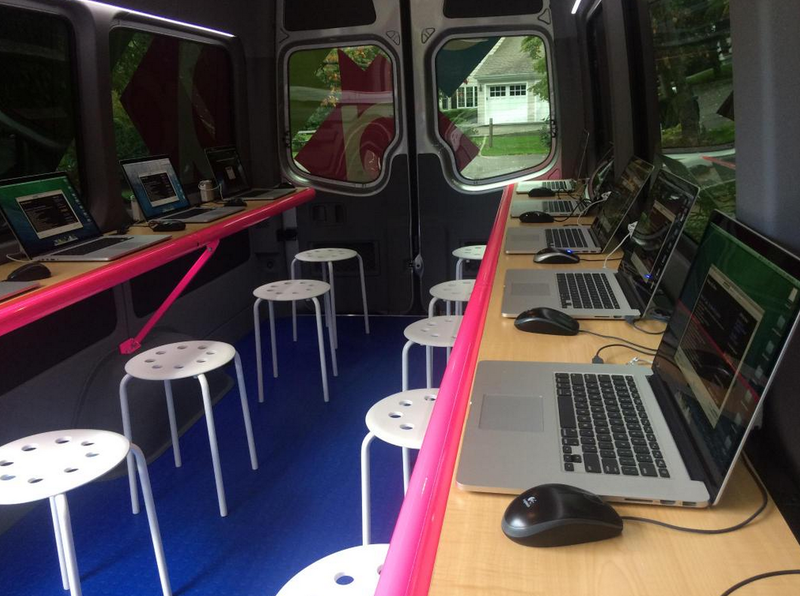 With this mobile computer lab, we can offer nearly every single class that we teach in our White Plains facility, anywhere in Westchester, Southern Connecticut and Rockland. The DAExpress is equipped with 10 brand new Mac Book Pros, a Makerbot Replicator 2 3D printer, and the best digital teaching tools. We bring The DAE to you! …and more! We also run private, custom classes that we bring right to your door. 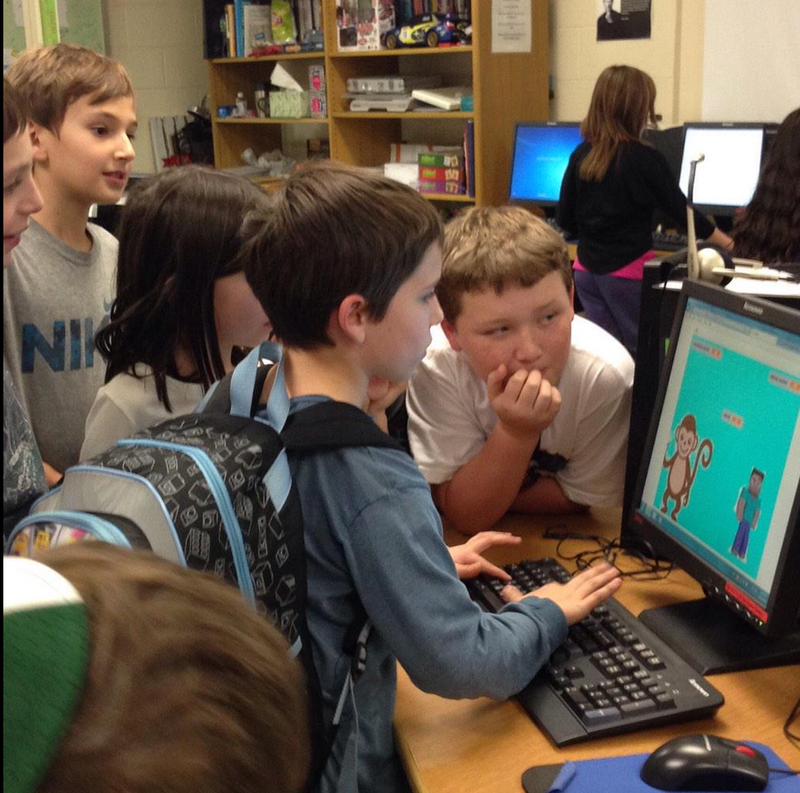 Students at Solomon Schechter show off their final projects in Scratch coding! In addition to that, we don’t always use our Mobile Classroom when we travel to schools. Often times we will drive over and use the school’s computer room or media lab and provide classes out of there. In many cases, schools and organizations do not have the necessary equipment to provide such classes on their own. That is one of the reasons that The DAExpress came about. 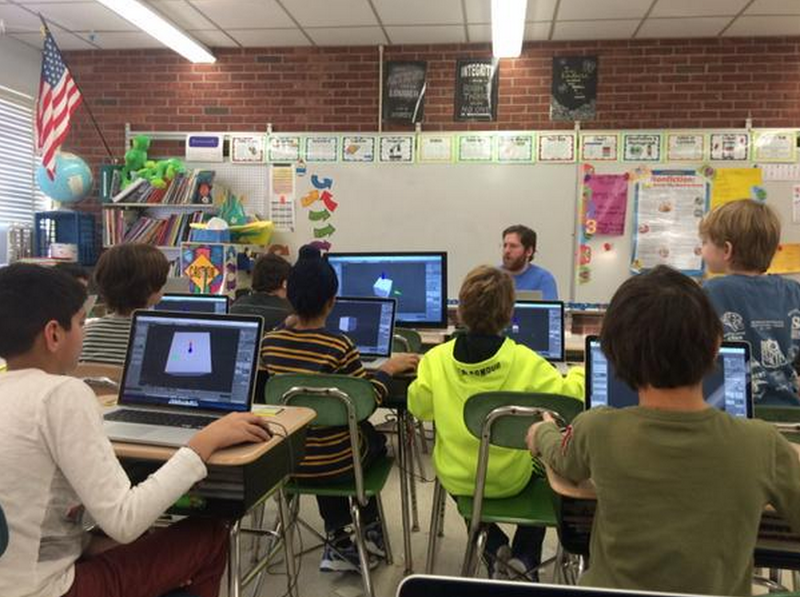 Animation Instructor Nicholas Sceusa teaching 3D Minecraft Animation using a powerful 3D Animation program, Blender. We can also provide Professional Development to school staff. In short, there is a lot we could do with our Mobile Classroom. As time goes by, we discover new and unique uses for it. We are excited to keep it “rolling” and see where the future takes us! Do you know of a school or local organization in need of After School STEM related programming? Contact us at info@TheDAE.com or feel free to visit our website www.TheDAE.com to learn more. Stop Motion Animation using LEGO at Heathcote Elementary School. The DAExpress Mobile STEM Lab: Rob & Emily get ready to depart for a class! The Mobile Classroom accommodates up to 10 students plus an instructor. It’s BlueTEC emission system system will produce zero odor. The DAExpress is now rolling through Westchester! Last month, The Digital Arts Experience started running classes out of our mobile STEM classroom, The DAExpress, at schools and private homes all throughout Westchester, Rockland and Fairfield Counties. While most of the classes take place on-site at schools for after school programming, The DAExpress also runs custom classes right outside of people’s homes and will soon start running Minecraft birthday parties for kids. So what is the vehicle all about? A DAE staff member that is trained in CPR, AED & First Aid will be present at all times. Well, this sounds really cool. But is it safe for the kids? Kisser also goes on to add that the vehicle uses an advanced ventilation system using BlueTEC Clean Diesel technology to ensure that fresh air is continually circulated at a comfortable temperature. It’s the world’s most advanced, ultra-low emissions engine. Using a solution called AdBlue, the system converts typical exhaust fumes into nitrogen and oxygen, which is naturally in the air we breath. ADAC, Germany’s largest automobile association, rates BlueTEC as #1 in CO2 emissions. BlueTEC is the greenest & cleanest diesel technology in the world. For local schools, we’ve typically worked with the PTA president or the person in charge of after school or lunchtime programming. If you are interested in getting your kid’s school involved, e-mail Rob Kissner at Rob@TheDAE.com. For a private lesson at your home, feel free to reach out to our Director of Community Relations, Jess Hachigian, and he’ll help you with everything you need to get it all set up! For any other questions, inquiries feel free to give us a call at (914) 644-8100, e-mail us at info@TheDAE.com, or visit our website at www.TheDAE.com.